Approximately 8"W x 4.75"H x 1.25"D with a capacity to fit a cell phone up to 4" x 6.75"
This is the perfect wallet that is big enough to keep everything you need! 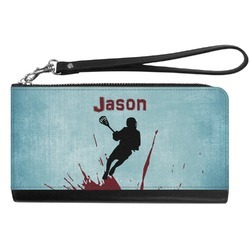 The best part is that it's a wristlet so that you can keep yourself hands free. There's so much space in this wallet that you could even fit your phone inside. This wallet with gorgeous genuine leather accents is made right here in the USA. The front of the wallet where your design is printed is made of a sturdy fabric, while the rest of the wallet is made of beautiful black genuine leather. The zipper goes across the top of your wallet and down one side. 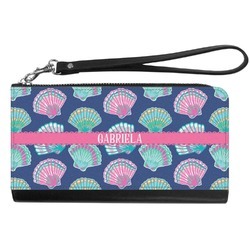 The wristlet handle is clipped to the zipper and is removable. Inside you will find two sections cut down the middle by a zipper pocket for coins. There are 6 credit card slots and 2 bill compartments. The wallet measures at approximately 8"W x 4.75"H x 1.25"D and has the capacity to fit up to a 4" x 6.75" cell phone, which includes the iPhone 7, iPhone 8, as well as the plus sizes and the Samsung Galaxy S8, and Samsung Galaxy S9. To care for your wallet we recommend lint rolling the fabric and taking a damp cloth with mild soap to gently clean off any dirt. We also recommend using leather conditioner to keep your leather accents looking new. Go into our design center to get started. Search through our patterns, ribbons, graphics, fonts, and more to find the perfect thing for you. If you get stuck and need help we are right here beside you to get you back up again! 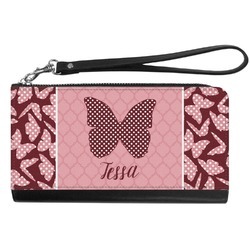 This wrist wallet is the perfect Gift for any lady in your life. Check out our Gifts For Her section, where you'll find anything from ladies leggings to stainless steel tumblers. You can also compare all of our ladies' wallets to be sure you are getting the perfect one.